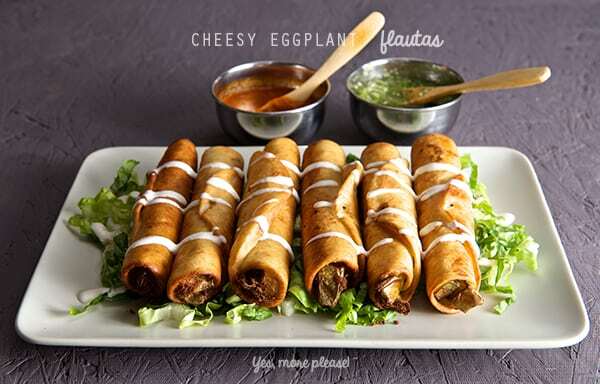 Cheesy Eggplant Flautas ~Yes, more please! Roll e’m up, folks! 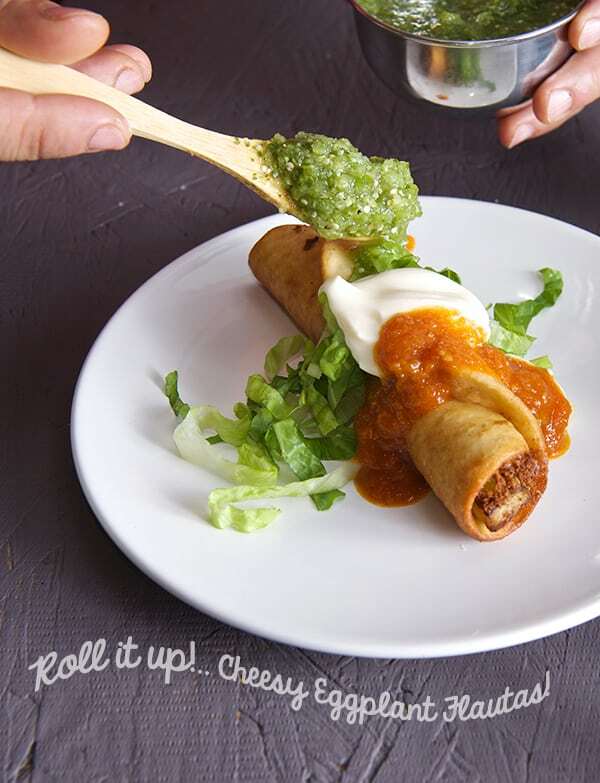 These Flautas ~a.k.a~ rolled tacos are scrumptious! 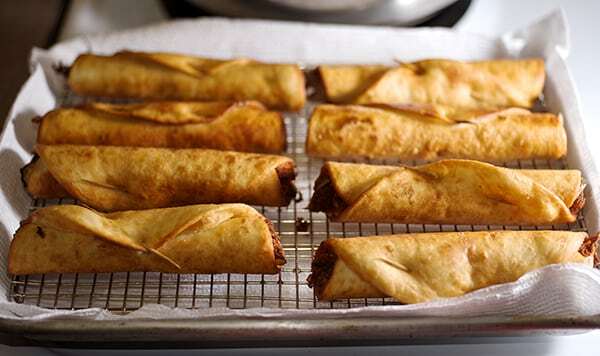 They are filled with quickly sauteed eggplant and a strip of Oaxaca stringy cheese in a thin flour tortilla. 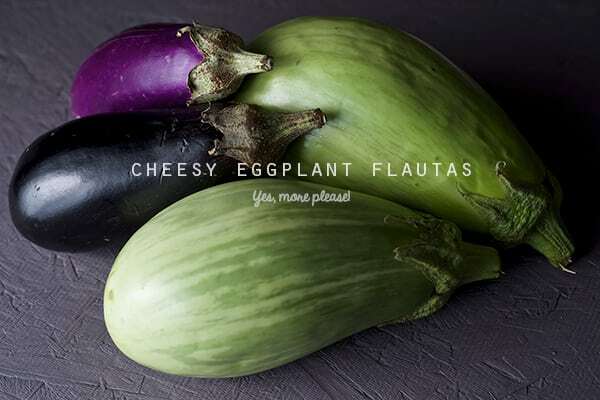 THis recipe is quite different from your regular eggplant recipes. 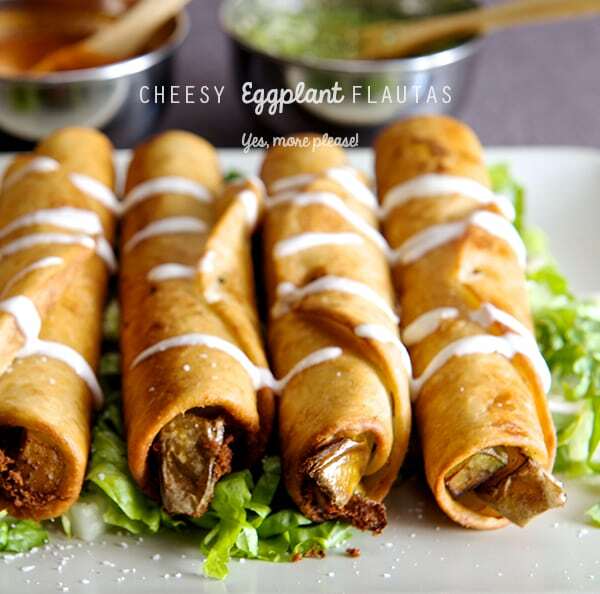 The eggplant marries to the cheese inside of the crunchy warm rolled-up flour tortilla, making the filling into utterly creamy vegetable goodness. They are best served on a bed of crisp fresh lettuce, drizzled with some liquid sour cream or Mexican cream. 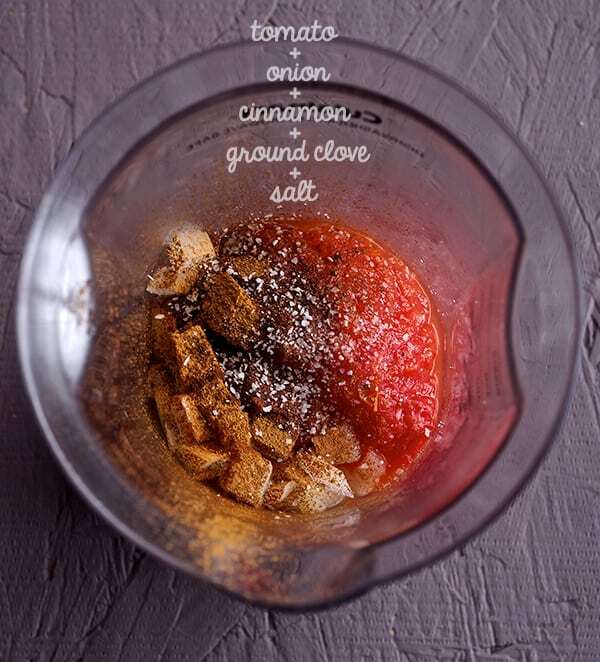 You can make my fabulous Tomato-Cinnamon sauce for dipping it is slightly spicy and sweet, the cinnamon warms up the tomato flavor is a match made in heaven with the eggplant. A Salsa Verde also works divine… you choose, or make them both, why not?! I struggle to find a great variety of quick dishes for eggplant. 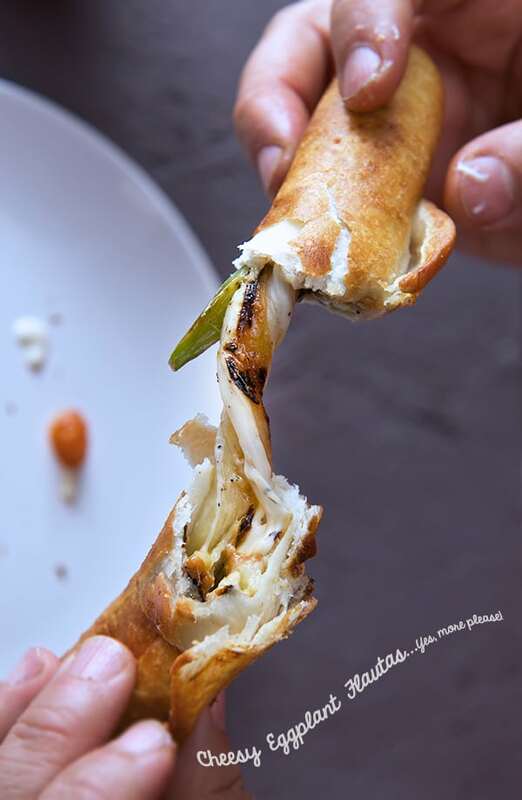 Cheesy Eggplant Flautas are a great way to utilize those extra eggplants and a fun vegetable option that makes for a great, simple and delicious entree. 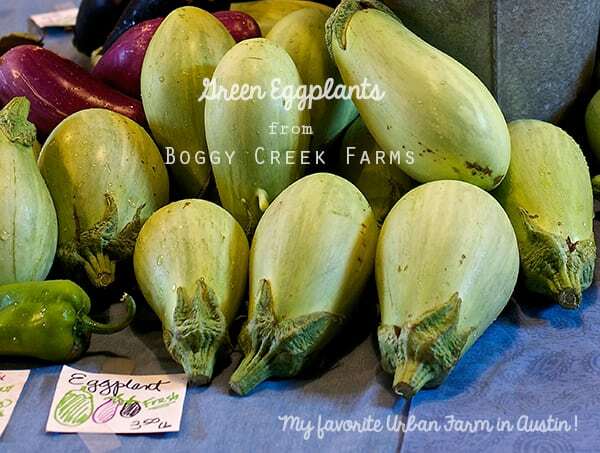 Now, get those eggplants rolling. Have fun! 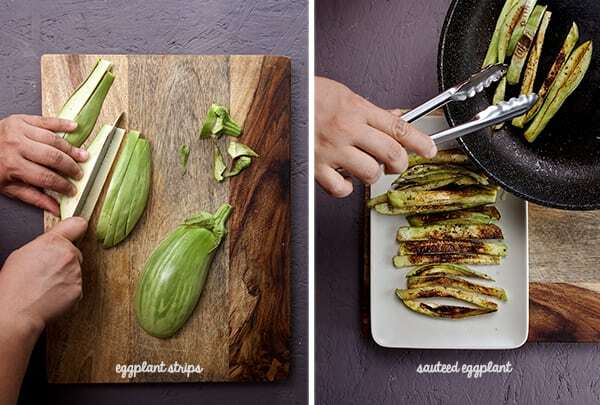 1 large eggplant cut into thick strips. ½ pound of Oaxaca cheese. 4 cups of corn oil for frying. 1-2 cups of finely shredded Romain lettuce. 1 large red tomato such as red prudence or 2 Roma tomatoes will do too. ¼ cup fine diced sweet onion. 1 small glug of grape seed oil or mild olive oil. 2. Boil the tomato and puree it. 3. In a small pot add oil and saute the onions until soft and translucent. 4. Add the spices and salt stir until well combined and fragrant. 5. Add the tomato puree and the sugar and cook for 3-5 minutes. 6. Turn off the heat and add the apple cider vinegar, adjust seasonings. 1. Saute the thick eggplant stripes using a little olive oil, season salt and pepper. Set aside. 2. String the cheese into a thinner stripes. 3. Slightly warm up the flour tortillas, place one or 2 eggplant stripes and some cheese strings roll it tightly and secure the end with a wooden toothpick. Proceed with the rest. 4. In a medium size heavy bottom pan add the 4 cups of oil and warm up until your thermometer reaches between 350-375 degrees. NOTE: Take care while frying to avoid any skin contact with hot oil. Watch the pan and carefully monitor the temperature. 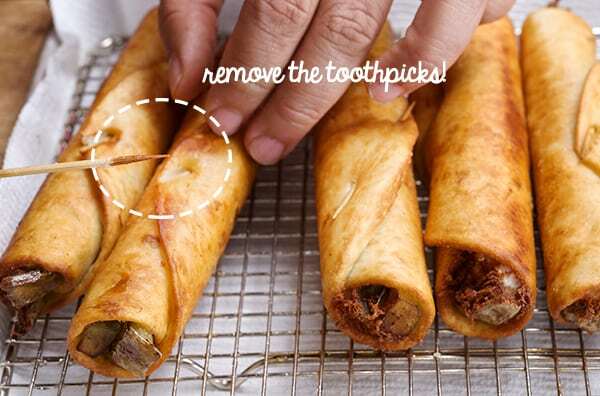 Avoid all distractions since these flautas cook very quickly. 5. 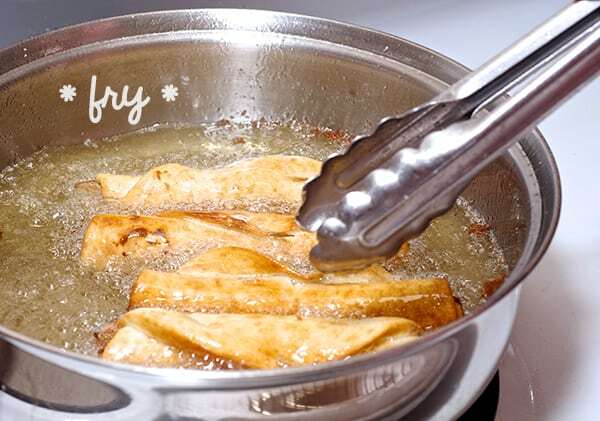 Fry the flautas until evenly golden brown around 2-3 minutes or less. Watch them at all times. 7. 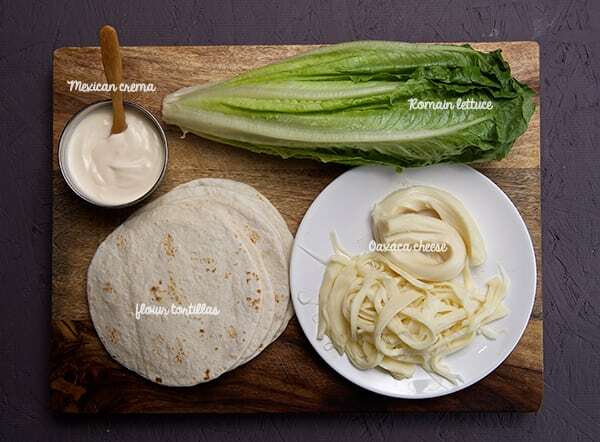 Serve immediately on a bed of lettuce, drizzle the crema, dip into the salsa roja or verde…. bite, dip-bite-repeat. Enjoy! Hurry up and get yours before they are gone!